A spectacularly designed swimming pool or spa is only as enjoyable as it’s quality of construction. Pools Unlimited, Inc. prides itself on its ability to construct a magnificent backyard oasis with minimal intrusions on the customer's property or everyday schedule. In most cases, our construction process will allow you to be enjoying your in-ground pool or spa in as little as a few weeks. Outlined below are the steps we take to give YOU the backyard pool or spa of your dreams. With this information in-hand we create a custom 3-D drawing before construction begins. These realistic drawings allow you to visualize the elements of your pool design and make any revisions or improvements as you would like. 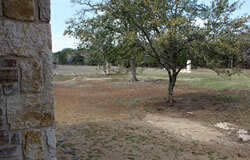 Once the design is approved, the layout process will begin. 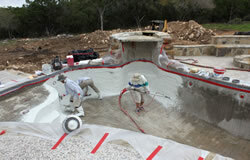 Your pool is marked on the ground prior to excavation per the dimensions outlined in your pool design. This provides you the opportunity to see the expected size and shape of the pool or spa. We can make any layout changes, as needed, before the actual ground breaking and excavation begins. Once the layout stage is complete and approved by the client, we begin excavation in order to prepare the site for construction to begin. 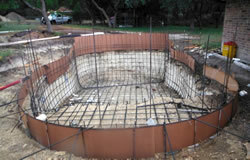 Just as steel and wood form your home's solid foundation; it is also used to form the shape and structure of your pool. Depth perception of the pool site now comes into view. 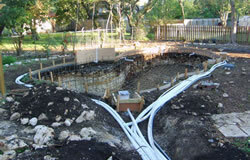 Before the gunite stage, plumbing and electrical components are installed. Plumbing lines are installed using schedule 40 PVC pipe. All plumbing lines are pressure tested to check for leaks and all electrical meets the necessary city and state codes. The gunite stage is awesome to watch. A team of experienced personnel "shoot" the entire pool structure with 4000 PSI gunite (a cement/sand mixture) using high-pressured hoses that form the strong inner shell of the pool. 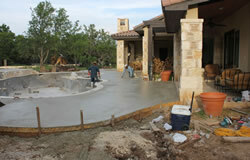 Your pool or spa will begin to take shape, now seeing your dream come to life. The deck is the outside area surrounding your pool. There are many surfaces which can be used based on your personal tastes & style. We offer a variety of finishes to choose from; standard Sundeck materials, custom stone, flagstone, rainbow rock, spray deck or stamped/stained concrete to compliment your home and property. If you choose outdoor amenities such as fireplaces, kitchens, fountains, water features, etc. this is the point at which these are created. 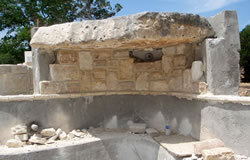 The coping is added to the edge of the pool. The tile is set at the water line. There are wonderful selections available for both tile and coping. Natural stone tiles, slates, ceramics and mosaics. 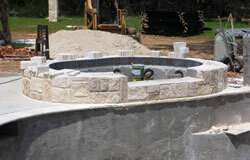 The pool coping can be crafted from natural stone, limestone, brick, cement or other materials which create your own unique style to the pool. 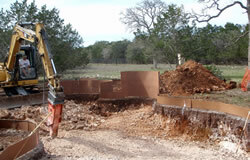 The final stage of your project will be a coating of plaster over the gunite shell. Choose classic white marble or a wide range of colors from our samples and brochures in our showroom. This process requires a quick, hard working, experienced team to smooth the surface to assure a beautiful finish. 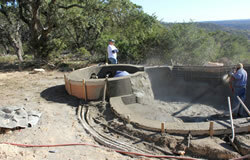 Upon completion of plaster the pool is immediately filled with water. The next seven days the pool will require the brushing of the plaster surface twice daily to ensure a smooth clean surface. That’s it! Chemicals are added to your new pool, spa or water-feature and you are just about ready to dive in! Often a first time pool owner can feel overwhelmed by the initial start-up and maintenance of their pool. Pools Unlimited, Inc. provides each pool owner with the necessary training, pool school, teaching them how to operate the controls of the pool equipment, plus a complimentary manual which outlines and explains, in detail, how to easily take care of your pool. In addition, we have a service department that is available to answer any questions you have regarding the care of your new pool and equipment. Please do not hesitate to contact us, our service and availability does not stop here.